The continuing struggles of Pakistan's batsmen has come under scrutiny again after posting totals of 160 and 178 in their loss to West Indies in Providence. The performances, on an admittedly tricky surface on which West Indies also struggled, shone a light again on the inexperience in the line-up, particularly the middle order, and an over-reliance on the captain Misbah-ul-haq and the currently absent Younis Khan. A number of former cricketers have jumped in with their thoughts on the problem, a debate carried out as talk of the need for a batting consultant or coach in the set-up also increases. According to former Pakistan captain Hanif Mohammad, the problem lies in the demands of the format. "Test cricket is a different ball game altogether and it needs more concentration on the technical aspect," Hanif told the Express Tribune. "Most of our players fail to understand the difference between limited-overs and Test matches and they play both formats with the same approach." Hanif's comments are vindicated to an extent in that that there has been only one Test century by a Pakistan batsman in the last twelve months; Younis Khan, against South Africa in Abu Dhabi. Plenty of batsmen have got half-centuries - Misbah alone has seven - but haven't gone on to convert. It is not as if the batsmen have been raking in the runs in the one-day format either. The last time Pakistan scored more than 300 runs in a one-dayer against a Test-playing nation was against Bangladesh in June 2010. They struggled with the bat during the World Cup and didn't manage anything more than 248 over five one-dayers in the West Indies. Hanif also pointed to a weakness against swing as one of the reasons for the loss in Providence. "Pakistan have always struggled a lot against swing bowling and this is one of their weakest points," he said. "In our first-innings we went on the back foot and lost wickets, while in the second-innings we struggled against swing bowling." Pakistan could not cope with swing on their now infamous tour of England last summer and were bowled out for less than a hundred thrice during the Tests there. Since then, there have been improved performances thanks largely to Misbah's form since being given the captaincy. They have come across friendlier pitches in the UAE and then did well to notch up substantial first-innings totals in New Zealand, but batting long - individually or collectively - has proved problematic in the absence of men such as Inzamam-ul-Haq, Mohammad Yousuf and Younis. In Providence, they also struggled against the legspin of Devendra Bishoo in their first innings, before being troubled by the swing of Ravi Rampaul and Darren Sammy in the second. The seven dismissals Sammy managed in the Test - five lbw and two bowled - were similar in impact to the way Nuwan Kulasekara troubled Pakistan with inswing in Sri Lanka, in 2009. Aamer Sohail, the former Pakistan opening batsman, said the problem went beyond playing swing bowling or spin, and there was a need to improve young batsmen's technique at a nascent stage. "Basically we have to improve our batting technique at the grass-roots, club and first-class level to prepare better batsmen to cope with all kinds of situations," he told the Dawn. Meanwhile, another former Pakistan batsman Zaheer Abbas has said it is up to Pakistan's board to remedy the problem. "Pakistan's batsmen have been struggling throughout the tour, so I think the PCB will have to do something to overcome this problem if they want to form a good side," Abbas told the News. The PCB did bring in Javed Miandad as a batting consultant before both the New Zealand and West Indies series, but have not appointed a permanent batting coach. On that subject, Hanif said Pakistan do not need one. "I don't think we need a special batting coach as the current players are experienced enough to tackle things on their own," he said. 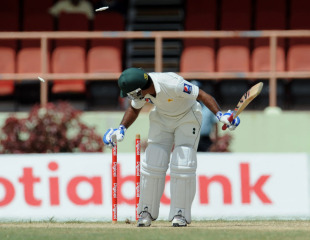 The next Test between Pakistan and West Indies starts May 20 in St Kitts.